Kenton Kilgore’s first young adult novel is “Dragontamer’s Daughters.” He took much of his inspiration for it from his childhood in Arizona and his studies of the Navajo people. 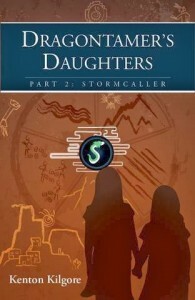 He has just released the second novel in this series: Dragontamer’s Daughters, Part 2: Stormcaller. Available for Kindle and for Nook and iPad. Background: The Dragontamer’s Daughters, the first book in your series begins in the unforgiving high desert in the Old West of an alternate Earth. Isabella, who is almost 13 years old, and her eight-year-old sister, Alijandra scratch out a meager life with their parents. Their home is a shack deep in the lands of the Diheneh, the indigenous people, far from the family’s former country of Ysparria. And they find a small dragon. And the second book continues the story. Jan: What are you writing now? Will you write a third book for the series? 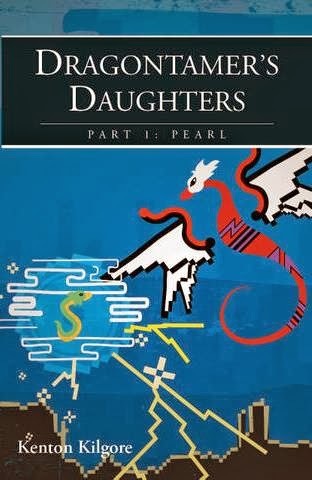 Kenton: I don’t anticipate writing a third Dragontamer’s Daughters; the two books tell the whole story of the two girls and Pearl, at least for now. I’m currently writing Lost Dogs, a young adult science-fiction novel set on present-day Kent Island, about two dogs who witness the end of the human race. Jan: What was the inspiration for your young adult series featuring girls and dragons? Kenton: Dragontamer’s Daughters started off as fairy tale I wrote for my daughters, who were 9 and 4 at the time. As they grew, I kept expanding and rewriting the story, until it became 600 pages across two books. Jan: What have you learned from the process of writing, publishing, and marketing to young adults? Kenton: I’ve found that there is a need and a desire in the young adult market for honest, original works. There are many, many young adult books published every year, but a lot of them are derivative, chasing after Harry Potter or Twilight or Hunger Games. Young-adult readers are always looking for something new and different, and my goal is to give it to them. Kenton: I’ve been nothing but pleased about working with CreateSpace. It was very easy to upload and format my books so that they would look just as good as traditionally-published works. By using CreateSpace, my books are automatically available on Amazon, and I can purchase discount-rate copies from them to sell at book signings and events. The only costs I incurred through CreateSpace were printing and shipping of review copies that I ordered during the final editing so that I could see what the physical book would look like. And even that wasn’t obligatory: CreateSpace provides a digital version of your printed book that you can look at online to see how it will turn out. 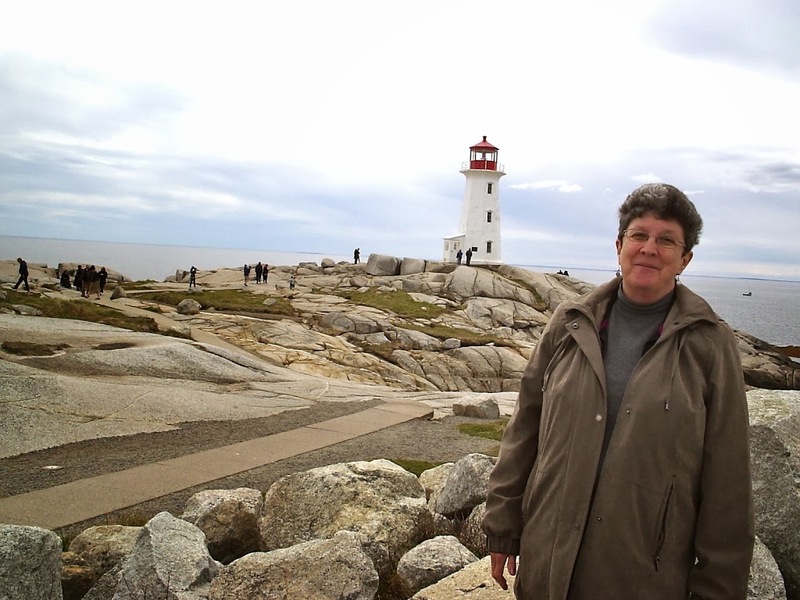 Jan: How have your interests changed and evolved as a writer since your graduate school days? Kenton: Back then, I was all about plot and spectacle. These days, I’m more interested in characterization. A lot of sci-fi and fantasy stories don’t have good characters, ones that seem like real people whom you can care about. So that’s most important to me when I’m writing. Jan: Who are among your favorite writers and what are you reading now? Kenton: Mostly, I read non-fiction, but my favorite authors are J.R.R. Tolkien (of course), Michael Moorcock, Ray Bradbury, Harlan Ellison, Jorge Luis Borges, Cormac McCarthy, and Ernest Hemingway. I’m also a big Shakespeare fan, though of his tragedies and histories over his comedies. Currently, I’m reading Locksmith’s Closet, by Eastern Shore author Paul Briggs. Jan: In December you donated 100% of your profits from your novel to the Navaho Water Project Charity to dig a well to provide clean water on the Navajo reservation. What was your inspiration for this project? How can interested readers donate to this project? Jan: What is the best writing advice you ever received and what advice have you chosen to ignore? Kenton: The best advice I ever received was from J.R. Salamanca, a creative writing teacher I had in college. He taught me to be careful and precise with words, and to rid my writing of unnecessary or weak ones. The advice I’ve chosen to ignore is to “just write and don’t worry about whether it’s good or bad.” I used to do that, and it lead to a lot of carelessness and poor writing. So, it takes me a while to write, but I believe the quality is much better than what I would have produced had I not been meticulous. This entry was posted by Jan Bowman on Friday, March 7, 2014.